Ever looked at an F250 or Silverado and wondered what it’s like to drive? Wonder no more, we’ve done the test and here are the results. Most people will be considering one of these big American trucks instead of a large wagon like the LC200, so with number crunching done last month we lined up a Sunland Patriot caravan loaded to 3000kg, an unmodified LC200, a Performax Ford F250 and a Performax Chevy Silverado. We then towed the Sunland over exactly the same mixed-roads route at exactly the same speed with all three vehicles, eliminating as many differences as possible so we can bring you a direct three-way comparison. The LC200 was up first, and it had little difficulty pulling the trailer, but you knew there was something on the towball. There was pronounced fore-aft pitching over broken bitumen, and around corners the trailer would push the car slightly wide. The engine had work to do, holding revs longer and changing up later, but there was never occasion to demand its full capability. Braking was acceptable once the electric brake controller was dialled in, but still needed a little bit of extra pedal power. 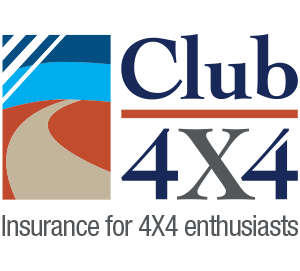 Steering was direct, traction was never a problem thanks to full-time 4WD and the ride was comfortably soft. With aftermarket suspension the fore-aft pitch would be reduced albeit at the cost of a slightly firmer ride; a worthwhile trade off. Overall, the LC200 did the job well enough but I was eager to see the difference with the F250. The F250 experience started as soon as I got in, or rather up. It’s a much, much bigger vehicle; about a 1.3m longer than the 200, and 70mm wider. The cabin looks and feels huge, yet the features you’d find in standard Ford cars are there such as the Sync 2 infotainment unit, power seats, aircon and the like. Visibility is excellent from such a high vantage point, and the big mirrors make it easy to see around the trailer, as well as its wheels. Start the engine, and there’s a pronounced grumble, but it’s not particularly truck-like – even the 200 is no limousine. But soon as you move off the big Ford feels its age. The steering is light but slow, taking noticeably more spinning of the wheel than the 200 to get the desired effect. That’s fine, it can be lived with, but there’s a horribly large dead zone, devoid of feel, in contrast to the (relative) directness of the LC200’s steering. The first several hundred metres over some rougher bitumen indicate that the ride is firmer, and busier … but the fore-aft pitching is completely absent so there’s more confidence but slightly less comfort. Around the corners and on the straights I cannot feel the trailer on the back, similar to towing a 1000kg camper with a 200, it’s as if three tonnes has disappeared and I half-seriously glance in the mirrors to check we have not in fact lost the caravan. 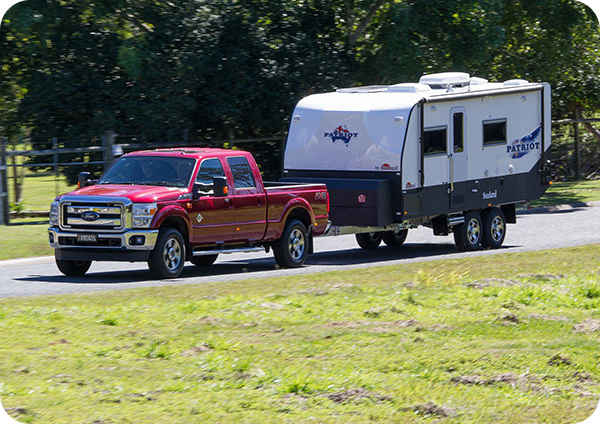 The F250 is in Tow/Haul mode, which not only optimises the gearshift for towing, but also increases the cooling to the engine and transmission. It also uses the engine to brake, very smoothly selecting precisely the right gear of its six available so you need only the most delicate touch on the brakes. If needed, there’s exhaust brakes too. Around the tighter ninety-degree suburban corners there’s no noticeable difference to the LC200; you still drive the rear axle of the trailer. Anyone confident with towing a trailer with a 200 will have no concerns when behind the wheel of the F250. So far so good, but there was one thing the Ford could do better. The road was dry, the day was hot and the tyres were new yet it was easy to spin a wheel on a brisk take-off; one example was waiting to turn left while on a slight upslope that was dusty from construction works and departure required no delay due to oncoming traffic. The Ford briefly spun a wheel, which is bad news, but the good news is that the electronics quickly quelled the wheelspin with no loss of momentum or disturbance to the vehicle’s direction – if you didn’t hear it you wouldn’t know it had happened. This is where constant-4WD systems like that in the LC200 come into their own. Back in the yard and I reversed the trailer into a couple of parking bays. At low speeds the F250 is easy to handle; light steering, good visibility including the two-stage mirrors, and smooth availability of torque so you can inch forwards or backwards. As you’d expect, the drawback is the physical size of the vehicle and its 16m turning circle, but it’s not as bad as I thought although now the differences to the smaller 200 become noticeable. We also experimented with the trailer hook-up system, which is very good, showing a dotted line from the centre of the towball backwards, which means it’s easy to connect trailers. Overall, the F250 is a far superior tow car to the 200. It inspires an easy confidence the LC200 cannot deliver with this sort of heavy trailer, yet is just as easy to drive once you’re under way. The only downsides are really the ride, but that’s liveable with, and the steering. Performax tells me that next year’s model will rework the steering, and if that’s the case, then I’d pick it every day of the week over a 200 for towing anything over 2000kg. Now it’s time for the Silverado and I’m expecting more of the same. But it’s different to the F250, and that starts with the steering, which is far more direct. Not quite as good as the LC200, but close, and where I’d say the F250’s steering would be a negative, it’s fine on the Silverado. The ride is different too; smoother, not as busy. But the fore-aft pitching found in the LC200 is present in the Silverado, much to my surprise, albeit to a lesser extent. Like the F250, the Silverado has power and torque to spare, towing the heavy trailer with ease. Corners are no problem either, better than the F250 as the Silverado is the superior handler, and the trailer isn’t noticeable in the turns. Like the F250, the truck is in Tow/Haul mode and smoothly chooses its gears so, again, just an easy touch on the brakes is all you need for a stop. That makes for relaxed and easy driving. I’m interested to see what the traction capability is like. On one corner where the F250 briefly spun an inside wheel the Silverado just grips, and it’s only when I provoke it by tightening the turn and accelerating it spins for a moment. I conclude that the Silverado is better at putting its power to the ground, but then we stop at a traffic light. I make a fairly quick getaway, nowhere near full throttle, and there’s wheelspin, followed by a slight yaw movement that has me ever so slightly applying fractional opposite lock. I suspect this is due to the automatic locking differential – if a wheel spins more than 100rpm relative to its partner (about 16km/h) the differential instantly locks, and that’s not good for directional stability. It would be better to follow Ford’s approach and calibrate the electronics to deal with such situations, and change the rear-locking differential to manually operated. The Silverado is also noticeably noisier than the Ford, which was noisier than the LC200, and it’s not because the truck is working hard. However, I also drove another Silverado and that was appreciably quieter, so maybe it was an issue with that specific vehicle. The driving summary for the Silverado is similar to the F250 – it’s better than the LC200, more confidence inspiring and a more relaxed drive. If the trailer was smaller I’d choose the 200 for its handling and all-drive traction, but with the bigger trailers the insurance of these larger trucks is a premium worth paying, and I say that as someone who has experienced his fair share of “interesting moments” when towing. Or maybe you just want a large, practical ute with huge space all round and a decent payload while not forgoing the luxuries we take for granted in today’s cars. These trucks aren’t cheap, but given their capability can fairly be considered value for money and if you have a big job, you need a big truck. Interesting test,would be nice to see fuel consumption comparisons and specs. Non the less informative especially with caravans getting larger and heaver.